Quick and reliable for control tasks. The device displays a single measuring value at pre-determined parameters. Optimal for the analysis of processes and chemicals. Characterization of the wetting behavior of surface active agents. Continuous monitoring of manufacturing processes. Automatic measurement of temperature dependencies. 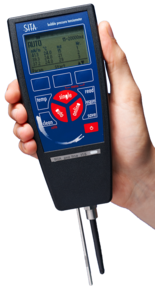 The SITA pro line t15 is an all-round talent among bubble pressure tensiometers. The measuring device has a comprehensive bubble lifetime range from 15 ms to 20 s for measuring the dynamic surface tension. It automatically adjusts the chosen bubble exactly without a drift or time-consuming readjusting by the operator. The Auto-Mode analyzes the dynamic behavior of the surface tension of surfactant containing liquids. Wetting characteristics of surface active liquids can be analyzed and the optimal bubble lifetime for the concentration control can be easily determined by the operator. The Online-Mode is used for a continuous monitoring of process liquids and for determining the temperature dependency of the surface tension of liquids. 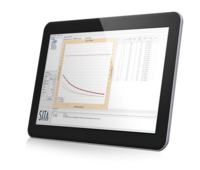 The measuring data can be saved in the Tensiometer SITA pro line t15, transferred to a computer or printed by an optional protocol printer.The software SITA-LabSolution realizes a visual presentation, evaluation and further processing of measuring data. Like all SITA Tensiometer, the SITA pro line t15 is based on the bubble pressure method for measuring the dynamic surface tension of liquids. Therefore, as it can be seen in the picture, an air stream is lead through a capillary into the process liquid and the pressure development for the bubble generation is measured. 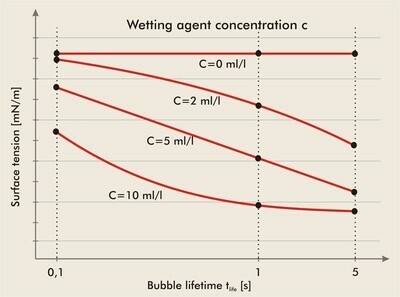 The picture shows the procedure of how to determine the optimal bubble lifetime for monitoring the concentration of a wetting agent. 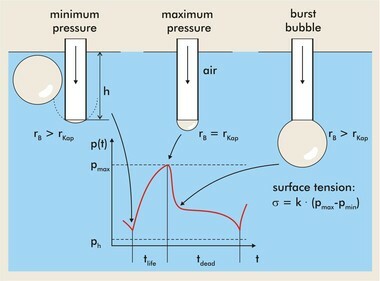 After measuring the dynamic surface tension of samples with different surfactant concentration in the AUTO-mode, the optimal bubble lifetime is chosen to be the maximum difference between surface tension values of the concentration range to be monitored. in the ONLINE-mode for determining the temperature compensation for monitoring the surfactant concentration. in the ONLINE-mode for the documentation of process development. for quality control and concentration control. Our application engineers advise you, if you can use the SITA pro line t15 for application and how to. Easy integration of Tensiometer SITA pro line t15 in a continuous process monitoring. 1 set = 10 pcs. Use our SITA pro line t15 for your application.